CyCon is a network administration tool designed to monitor and control a network of FireTower Guard-protected client PCs. Designed as a web application, CyCon can be accessed through an internet browser on any PC or tablet with administration login and password credentials. From there, it can be used to access information of all connected FireTower Guard client PCs. CyCon displays basic client PC information, Autorun entries, alerts and other critical system information. CyCon also enables administrators to perform advanced functions such as quarantining suspicious Autorun entries. CyCon is available in three different configurations, CyCon personal, CyCon Business (SaaS subscription servuce), and CyCon Business Enhanced for enterprise. Please visit Videos page for FireTower Guard Demo videos. CyCon Business and Business Enhanced are designed for large corporate networks as well as home office and remote networks. In the corporate environment, CyCon is a critical, centralized network administration tool for ensuring overall network security against Zero-Day cyber attacks and malware intrusions. In the home or small office environments, CyCon can be used as a tool for monitoring a handful of PCs or for providing easy access to support help. CyCon personal for the Consumer environment can be purchased through the Sampan Security online store and is pre-configured to monitor up to three PCs. 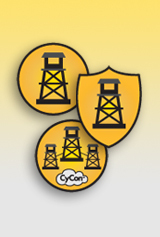 Separate FireTower Guard licenses are required for each of the CyCon-connected PCs.